Overview: Sulawesi is the world's eleventh largest island and Indonesia's fourth largest island. 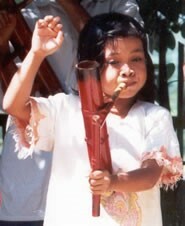 Minahasa and Sangir are two families of Malayo-Polynesian languages spoken throughout North Sulawesi. Christianity, Islam, and traditional religion are all practiced among the people groups that comprise the Minahasa-Sangir of Sulawesi people cluster.